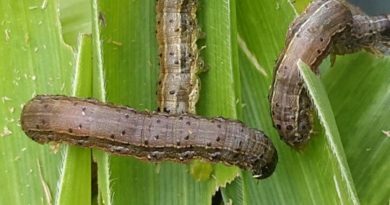 Fall Armyworms continue to ravage crops mainly maize on African continent despite the move to tackle these crop-munching caterpillars; a battle that needs Monitoring, coordination, research and information sharing according to experts in crop protection. As of now, the pest has affected millions of hectares and could push the continent’s over 300 million people into hunger, according to Food and Agriculture Organization of the United Nations (FAO). Various measures including pesticide spraying have been used to try combating this disease but it still resisting due to the fact that farmers do not stand up to pull together for to win the fight. To address the problem, FAO made a call for concerted and coordinated efforts among farmers’means representatives, agricultural scientists, development partners and the government in Rwanda on Friday March 23, 2018 in Kigali during an extra-ordinary session at which FAO and Rwanda launched two projects aimed at ensuring surveillance and early response against the destructive pest. 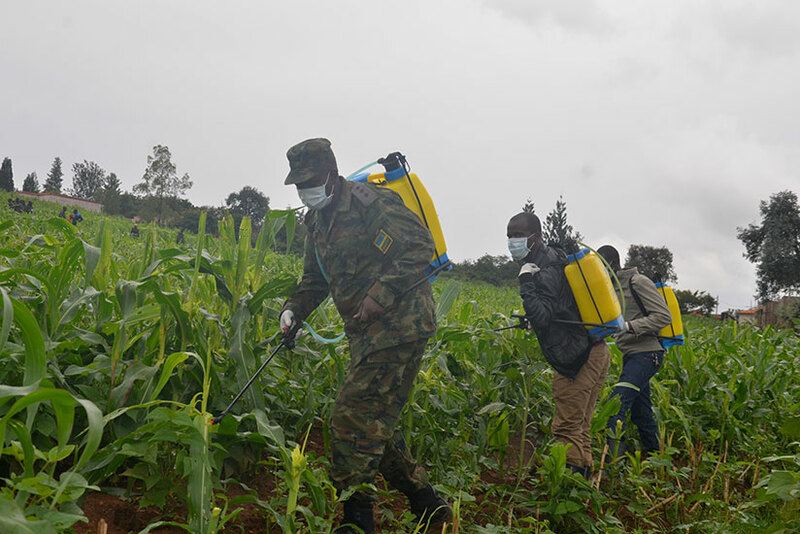 Farmers have pointed poor coordination and lack of information on pesticide quantity on crops to kill fall armyworms (FAWs) as some of the present challenges that need to be addressed to meet the goal. Daniel Gafaranga, the president of Imbaraga farmers’ association thanked FAO for the new project to combat FAWs using pheromone traps and a mobile application that will enable farmers to detect the FAWs on the crop and call for interventions. Gafaranga said this with an example of somewhere in Rubavu district where these insects damaged a huge plantation of maize. This farmer himself shared the strategy he used to control Fall Armyworms at 95 percent. “Last time I planted maize on 33 hectares and were attacked by the FAWs. The first time after revealing them, I sprayed pesticide and reduced FAWs at 40%. The second time I put pesticide they reduced at 70% and at 95% with the third similar practice,” Gafaranga said. He advised farmers to frequently visit their crops like once in three days to better control the FAWs. “Because you can find the entire plantation attacked when you do not respect this,” he noted. Gafaranga further insisted on information sharing on this threat between farmers themselves and agriculture decision makers for early intervention through community radios. Gafaranga said that 90 percent of farmers do not respect the quantity (dosage) of pesticide, which results in resistance of the fall armyworms on the plantation (due to a small quantity of pesticide) or involves the loss of farmers in terms of invested funds in buying pesticides (with unnecessary quantity). “When we exceed the quantity, we use much money to buy pesticides; and when we use less, the FAWs resist, we need a well-measured dosage of pesticide,” He said. Gafaranga also called for experts’ experience as techniques for combating the fall armyworms as it will boost them with extra skills. He pointed that a strong commitment will help to eliminate the FAWs as everyone stands up. “we need a policy to fight these Fall armyworms together as farmers because when I combat them but my neighbour farmers do not, FAWs will keep spreading to everywhere,” he observed. 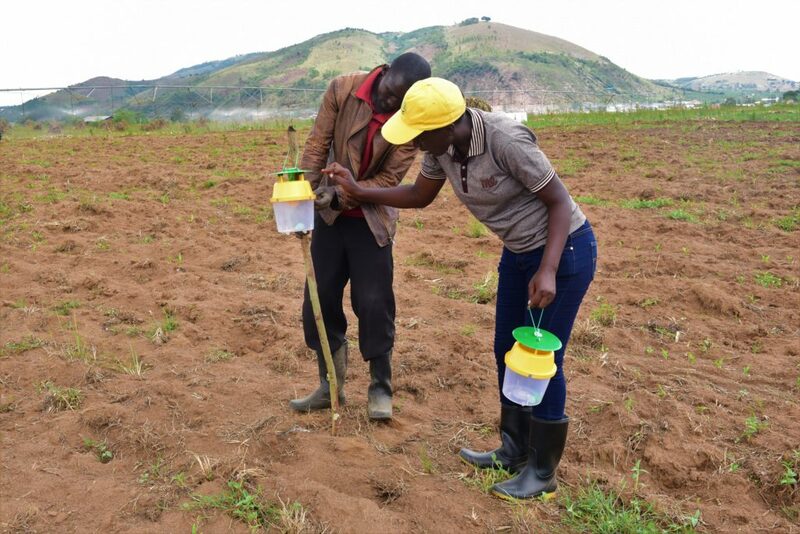 Gilbert Rutayisire, Director of Agriculture, animal and natural resources in Nyagatare district said farmers need a strong mobilization about fall armyworms as the majority of them do not understand FAWs. 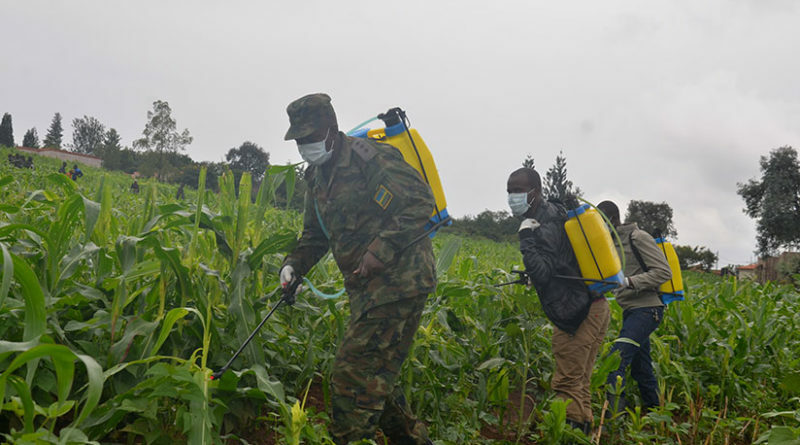 Among the main measures to combat the fall armyworms are FAO’s two projects, one in Gicumbi, Rubavu, Musanze, Gatsibo, and Ngororero. 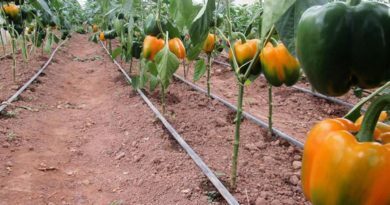 The second one will be operating in Nyamagabe, Nyanza, Muhanga, Kayonza, Rwamagana and Nyagatare and both projects will focus on farmers’ capacity building in fighting the Fall Armyworms. 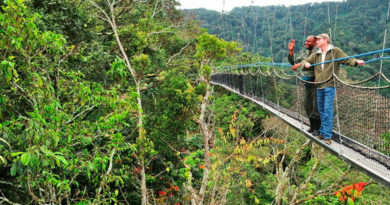 To support this move, FAO contributed $700,000 into these projects ($300,000 in Rwanda and $400,000 at regional level). In this mechanism, USAID also put $1million. Dr. Otto Vianney Muhinda, the Assistant FAO Representative to Rwanda said that there is a need for a strong coordination of everybody among the farmers besides significant efforts of police and army. “Everybody has tried to combat these caterpillars even the police, what is required is a certain control through the research on locally-made pesticides and awareness of farmers. We need something that can be working now through the awareness and methodology to help farmers combat FAWs,” said Muhinda. Muhinda said Rwanda as a country will coordinate efforts in combating FAWs though the combination of the national taskforce with the population’s contribution. Pheromone traps given to farmers recently will help detect FAWs and take measures to eliminate them using sustainable and environmental use of pesticide, caring about the biodiversity. Fall armyworms revealed in Latin and South America since 2017 and spread in Africa by the moths gradually within the same year. In February 2017, they arrived in Rwanda in Nyamagabe district. About 126 million of people in Africa have food insecurity resulting from armed conflicts and crop diseases including FAWs. “Countries can work together. Coordination must be there at country level to effectively combat the FAWs. Collecting and burning them is good but doing it together is better to move them away from farms,” said Muhinda. Fall Armyworms involved $2.6 billion loss on Africa continent currently. However, Muhinda said there is a hundred percent hope to combat them in Rwanda with partners’ efforts although they can’t disappear at all. FAWs can also delay the zero hunger target which is among the 17 SDGs or make it impossible according to Muhinda.